The classic shirt dress is always a favourite in the summer as it comes in so many fabrics, patterns and of course variations on the original style so it will take you to work in a smart, cool way or add some fun to a hot summer day or be the perfect dress for sightseeing and holiday shopping …. 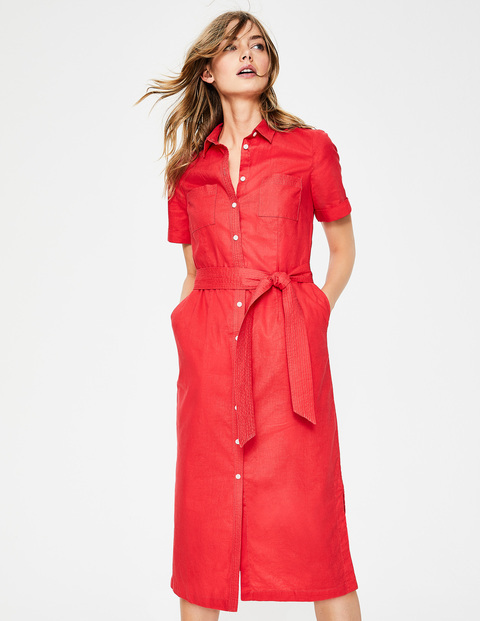 Boden have made this dress their own with all their fabulous variations..
Presenting Boden’s unique twist on the classic shirt dress. This versatile design stars a midi length, flattering side splits and stitch detailing on the placket, belt and pockets. The linen-and-cotton fabric will keep you cool and comfortable, no matter what your busy day brings. Tie up the fabric belt for definition or leave it loose for an easy, versatile look. You will love this shirt dresses. This bestseller is back in bold new prints and versatile colours (but with the same flattering flared skirt and nipped in waist).